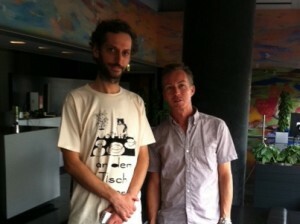 I had a conversation with Christophe Hetier, AKA DJ Anti Pop from Telepopmuzik, a talented French gent in Tokyo for the Cinemixa events 2011.7.28 & 30 where he performs a live improvised electro soundtrack for silent movie screenings. Click on the play button below for the quick chat & a (very) quick sneak preview of the new Telepopmuzik album due for release early 2012. Information about the Cinemixa events at these websites.. This entry was posted on Saturday, July 23rd, 2011 at 6:30 pm and is filed under Tokyo Direct. You can follow any responses to this entry through the RSS 2.0 feed. You can leave a response, or trackback from your own site.